For those of us who may be socked in tonight we have a link to the livestream of the eclipse. I subscribe to their email notices, which explains the end of the URL. You can go to their main site: http://griffithobservatory.org/ and scroll down to Upcoming Activities and Total Lunar Eclipse then Watch live online. That connection is real slow now. Looks like they are having clouds over LA. However we (Interlochen/Traverse City, MI) are partly cloudy with more clear spots than clouds, and the clouds seem to be thin. The GOES satellite is showing a thin lake effect flow from the north. So maybe we might pull this one off. GOES Great Lakes cloud animation for 9 p.m. Credit NOAA. Comet 46P/Wirtanen and the Pleiades. 9:24 p.m. EST, December 14, 2018. Canon EOS Rebel T5, f/5.5, 30 sec., ISO-3200, fl 55mm, tracking. Click on the image to enlarge. Credit Bob Moler. Finally, the skies cleared. The last time we had clear skies was early in the evening on the 8th. Our family went to the Ballet that evening at Interlochen Center for the Arts, and by the time I got back and dressed to go outside and observe the comet, it had clouded up. The Ballet was wonderful, by the way. Anyway, Comet 46P/Wirtanen as a few hours ago was greatly hampered by the nearly first quarter Moon. And it’s going to get worse as the moon’s phase gets fuller. I thought I could see it in with the naked eye. It was visible in binoculars. As you can see it did photograph well. I processed the image with GIMP to increase contrast, and reduce the background moonlight. There is no discernible tail visually or in this photograph. Longer exposures in a dark sky do show a faint ion tail. Remember this is a short period comet, and has been around the Horn (perihelion) innumerable times. It orbits the Sun from just inside Jupiter’s orbit to just outside Earth’s orbit every 5.4 years. 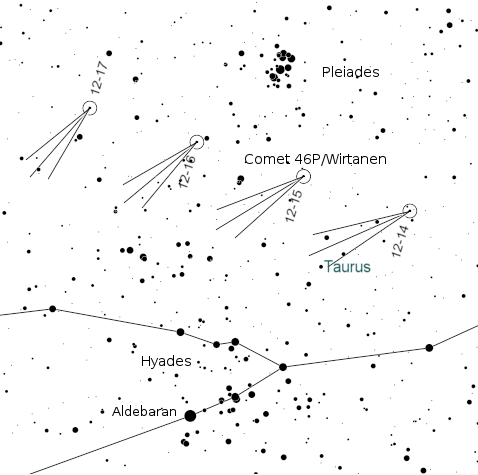 he path of Comet 46P/Wirtanen from November 21, 2018, to January 1, 2019. The labels are month, date, and expected magnitude. On November 22nd it was observed to be magnitude 5.5, about 5 magnitudes brighter than the predictions on the chart. Click on image to enlarge. Created using Cartes du Ciel (Sky Charts). Comet 46P/Wirtanen will be well placed in the evening sky for observation. Though a small comet, it has a history of being active, which is not disappointing us now. It will be closest to the Earth on December16th at 7.1 million miles (11.4 million km). 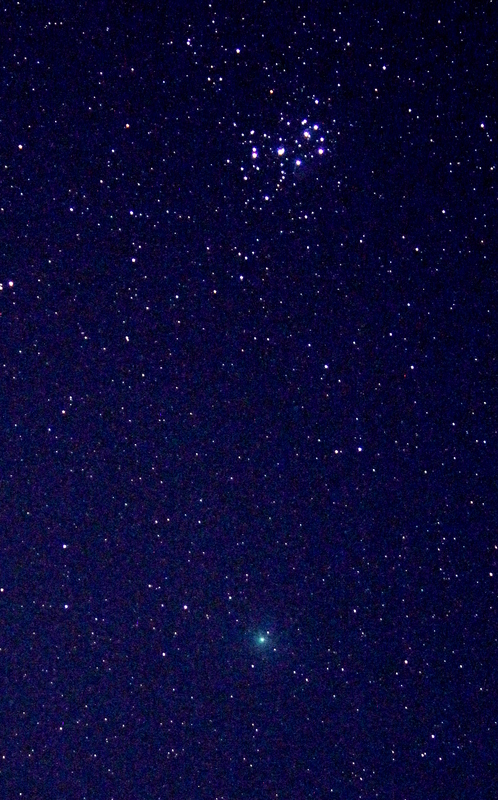 On December 16th the comet will be closest to the Pleiades. On the 23rd it will appear close to the bright star Capella. After that it will become circumpolar. Comet Wirtanen is a small short period comet of 5.44 years. It’s orbit doesn’t come as close to the Sun as the Earth. It’s closest to the Sun, called perihelion it which it reaches December 12th is about 98 million miles (158 million km). The orbit extends out to nearly Jupiter’s orbit. Checkout photos and animations of this and other comets in http://www.spaceweather.com/’s Realtime Comet Gallery. Also check out Seiichi Yoshida’s website and his weekly information about Bright Comets: http://www.aerith.net/comet/weekly/current.html. Here is a black on white chart that I created for our society’s newsletter of the positions of the comet when it passes the Pleiades. The positions are for 9 p.m. EST (01:00 UT on next date) on the displayed dates. Created with Cartes du Ciel (Sky Charts). Comet magnitudes are always devilishly hard to estimate. A comet always appears dimmer than its magnitude suggests because one is comparing the brightness of a diffuse object with the point source of a star. One either has to reduce the size of the comet to almost a point or defocus the star to the size of the comet to make the comparison if it doesn’t have a tail. A point about magnitudes. They’re like golf scores. The lower the number, the brighter the object, and the better the golf score. Blame the ancient Greek astronomer Hipparchus, who ranked star brightness from first magnitude for the brightest stars to sixth magnitude for the dimmest stars visible to the naked eye. Modern astronomers put a mathematical basis for the system saying that a magnitude difference of 5 equals a brightness difference of 100. So each magnitude step equals the 5th root of 100 or 2.512. So a 5thmagnitude star is about two and a half times brighter than a 6thmagnitude star, and so on. This post from the Grand Traverse Astronomical Newsletter “Stellar Sentinel” was written for August of 2018. The dates and times of the peak may change a bit from year to year. The Perseid meteor shower is the second most active annual meteor shower. The most active is the Geminids of December during a period that’s cold and generally very cloudy here in Northern Michigan. Consequently, I’ve never seen a Geminid meteor. The Perseid meteor shower is the most famous as the August meteor shower, coming on the warm summer month. In Northern Michigan the radiant of the shower, the point in the sky from which they appear to come, is circumpolar, which means they are visible anytime in dark skies from dusk to dawn. The Perseids are so named because they appear to come from near the constellation of Perseus the hero, an autumn constellation that starts the evening low in the northeast and rises and moves to high in the east near dawn. In earlier times these meteors were called the Tears of St. Lawrence, who was martyred in AD 255. His Feast day is August 10th, the day he died, which falls very close to the peak activity of the shower. The Perseid meteors are visible for over a month from about July 17th to August 24th, with peak activity between August 12th at 4 p.m. to August 13th at 4 a.m. EDT. So the peak activity will partially be during our night hours, and the one day old Moon will not interfere at all. The peak hourly rate may reach 100 per hour at times. All things being equal, the higher the radiant is in the sky the greater the numbers of meteors seen. The Perseid radiant will be rising all night, being highest as the first light of dawn appears. Even though the numbers of meteors are fewer I like to start looking by 10:30 p.m. With the radiant low in the sky, the meteoroid particles we see are almost skimming the atmosphere, lasting longer. There’s is nothing so cool as to see a bright Perseid meteor seeming to fly along the Milky Way. The radiant point is in the Milky Way between Perseus below, and Cassiopeia above. The Perseid radiant is located off the highest star is Perseus as it rises about 11 p.m. August 12, 2018. Click on the image to enlarge. Created using Stellarium. Observing this meteor shower is very easy and one needs no special equipment. A blanket to lie on, mosquito repellent, warm clothes, some water and snacks, if staying the night, and a dark location. My preferred location is the Dune Climb at the Sleeping Bear Dunes National Lakeshore. It has no light, except the occasional car lights and has modern restroom facilities and a low horizon except in the west. I supposed one could climb up the dune to get rid of even the car lights. Even though the radiant is in the northeast, the meteors will appear all over the sky. Binoculars are nice to take a break to explore the Milky Way and to observe the smoky train left by a particularly bright meteor. These can be viewed for a minute of more and deform and twist due to the different wind directions and speeds at different altitudes. What causes the Perseid meteor shower and why does it occur at the same time every year? The Perseid meteor shower, like all meteor showers are caused by the debris left along the orbits of comets. If the comet’s orbit crosses close to the Earth’s orbit we can get a meteor shower. Comets spend the majority of their time far from the Sun, where it’s very cold, and are in very elongated orbits. Comets are made from rocky bits, dust and frozen gasses. As the comet comes into the inner solar system the Sun heats it up and the frozen gasses sublimate, are ionized by the Sun’s radiation and are caught into the thin ion tail. This liberates the comet’s fine dust which is blown away from the Sun by the pressure of sunlight into a broad dust tail. Larger particles end up traveling in the comet’s path, and are affected mainly by the Sun and the various gravitational tugs of the planets. The comet responsible for the Perseids is 109P/Swift-Tuttle. It was independently discovered by L. Swift and P. Tuttle in 1862. It was recorded as being seen in 69 BC by, you guessed it, the Chinese. It’s a big comet, with a nucleus some 16 miles in diameter, and it crosses the Earth’s orbit, so it is a potentially hazardous object, and if it hit the Earth, would wreak more damage than the asteroid that killed the dinosaurs. From the 1862 appearance the comet was given a period of 120 years. It didn’t show in 1982. An observation of the previous appearance of the comet in 1737 allowed a recalculation of the orbit and a new return year of 1992. That was correct. The comet was recovered that year. The comet will return in 2126. The calculations used to predict the 1992 return suggested that the comet could possible collide with the Earth. However observations of the 1992 appearance of the comet determined that the comet, though it would pass close to the Earth, is not a hazard. But it should be really bright. I can’t wait! In the early morning hours of July 10th the very northern part of the IPR listening area will have a chance to see the last occultation of the bright star Aldebaran for at last 15 years. An occultation is where the Moon in this case passes in front of or occults a planet or a star. In astronomy occult means to hide. The event is an occultation. There is no black magic involved. It will be a grazing event, with Aldebaran popping in and out of view at the mountains and valleys at the southern edge of the Moon along a line running south of Mackinaw City and across the eastern tip of the Upper Peninsula. 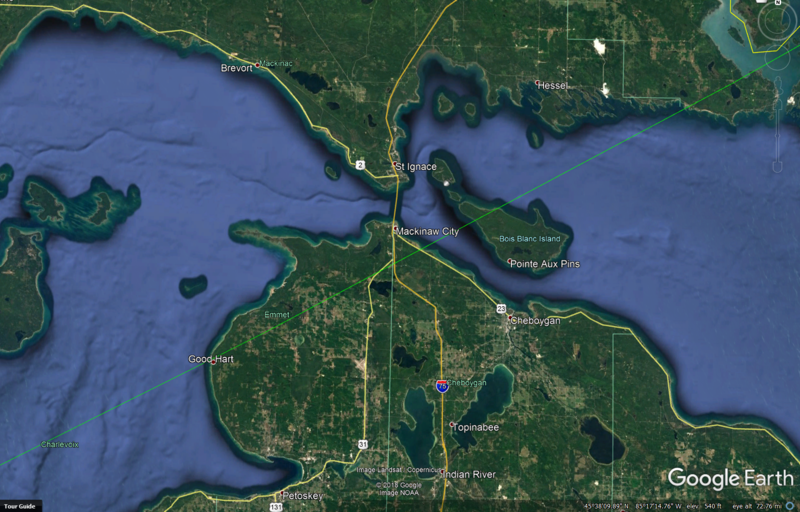 The Straits of Mackinac area showing the green southern graze line of the Occultation of Aldebaran. Credit Map Google Earth, Graze line by Occult 4. It’s a clear miss for the Interlochen area, with the star skirting the Moon at it’s 5 o’clock position. The time of the event will be near 4:38 a.m. with the maximum time of the event increasing from west to east at nearly 2,000 miles an hour. At that time the Moon and Aldebaran will be low in the east-northeast and only 7 degrees above the horizon. Location of the Moon and Aldebaran in the sky at 4:38 a.m. July 10, 2018 from the Interlochen/Traverse City area. More information on this occultation from Sky and Telescope is here. This will be the last occultation of Aldebaran visible from around here for the next 15 years. However starting in 5 years there will be a monthly series of occultations of the bright star Regulus, and the next year a series of occultations of the star Spica will begin. That’s just for the Moon with bright stars. The Moon occults many dimmer stars a month. A very important field of occultations is the observation of occultations of asteroids and Kuiper belt objects to discover their size, shape, any satellites and whether they have rings. Go to the International Occultation Timing Association https://occultations.org for more information.